On April 11, nourishlife.org is launching Nourish California, a bold new initiative to increase food literacy and build healthy communities. 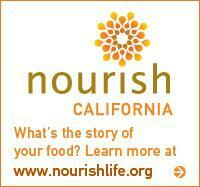 They're providing free copies of the Nourish DVD and curriculum to any California K-12 school that requests them. Working with a network of partners, they hope to engage thousands of California educators and more than one million students in "the story of our food." The vision of Nourish California is to build a statewide network of good food advocates who can directly contribute to the health of their schools and communities. A project of WorldLink, a nonprofit organization dedicated to education for sustainability, Nourish California supports educators who want to open a meaningful conversation about food and sustainability. In addition to offering multimedia teaching resources, Nourish California will offer ongoing teacher seminars and youth summits across the state.